Family Practice Physicians and Medical Practitioners from various specialties often apply Topical Anesthetics to the skin or mucous membranes of patients for the purpose of reducing discomfort during specific medical procedures. 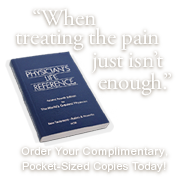 Physicians also instruct their patients on the application of prescription and over-the-counter topical anesthetics for the relief of discomfort due to back pain, or for the relief of itching due to allergic reactions, burns, and insect bites. These topical anesthetics work by numbing the surface of the affected area. Topical Anesthetics are supplied in creams, sprays, jellies, aerosols, ointments, or solutions and should be applied in the lowest effective dosage to the smallest area required.